Lysophospholipids (LPLs) are an essential family of lipids, which serve as bioactive molecules and as precursors and intermediates of the glycerophospholipid and sphingolipid metabolisms. In this work we primarily focused on the subgroup lysoglycerophospholipids that comprise a polar headgroup at the sn-3 position and a fatty acyl group at either the sn-1 or sn-2 position of the glycerol backbone giving rise to the two potential regioisomers 1-acyl-2-LPL and 2-acyl-1-LPL, respectively. 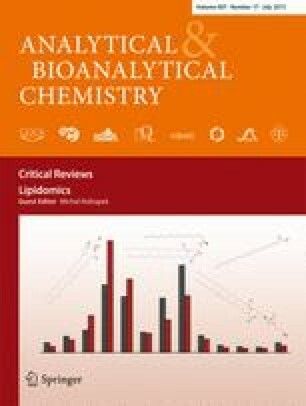 We established a quantitative lysophospholipidomics method combining hydrophilic interaction chromatography (HILIC) with the scheduled multiple reaction monitoring (sMRM) algorithm for profiling a vast number of LPLs simultaneously, including the 1-acyl-2-LPL and 2-acyl-1-LPL regioisomers. This approach facilitates baseline separation of monitored lipid classes and regioisomers, including sufficient separation of species having a different degree of unsaturation overcoming the overlapping effect of M + 2 isotopes. The lipid class-based separation improves the quantification of each molecular species as the internal standard elutes together with the endogenous species. The potential of this method is illustrated by analyzing LPLs from human plasma and skin samples. Altogether, 68 molecular lipid species, consisting of 110 regioisomers, were detected in plasma and 43 molecular lipids, consisting of 67 regioisomers, in skin samples. The novel skin LPL profile reveals that most of the lipid species exist as 2-acyl-1-LPL, in comparison to plasma where 1-acyl-2-LPLs are the dominant species. Published in the topical collection Lipidomics with guest editor Michal Holčapek. We thank all members of our laboratory for valuable discussions and suggestions, and the Finnish Funding Agency for Technology and Innovation (Tekes) for financial support.